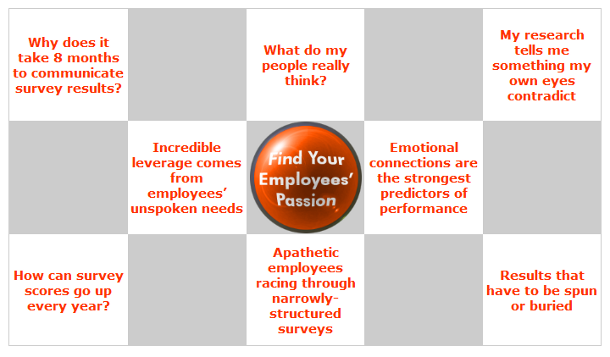 Using propriety survey technology, Resonance Strategies uncovers employees’ unspoken motivations, behaviors, choices and attitudes. Resonance delivers a unique combination of rich verbatims(“focus group on steroids”) and rigorous quantification (certified Six-Sigma accurate). In 1995, consultant, entrepreneur and market research pioneer Steve Gang and his colleagues in neuroscience, psychology and artificial intelligence developed a unique and innovative methodology for discovering and quantifying the passionate emotions that are so integral to people making decisions. This methodology is known as Resonance®. Since then, Steve has used Resonance® to help some of the world's best-known companies solve a wide range of difficult marketing, branding and organizational problems.